This, a kind of white gazpacho, is an amazing dish. The worst cooks can’t muck it up, you can make it in the last 10 minutes before guests arrive, and the unpromising ingredients of old bread, almonds, garlic, water and oil are whipped into something eminently appetising. Needless to say, neither your almonds nor your garlic should be old; in fact, plenty of purists would pound freshly shelled almonds in a mortar and pestle, or so they tell me. Your stale bread should have been good in the first place and your oil should be the best. 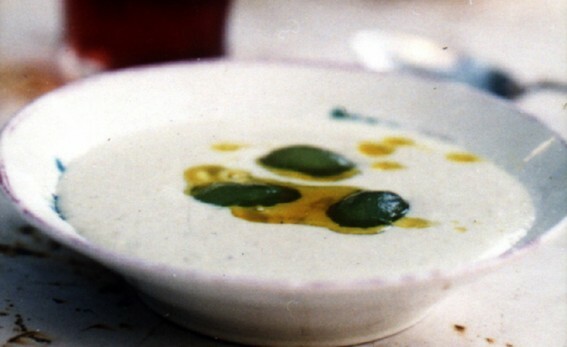 Serve Ajo Blanco well chilled in very small portions – it’s pretty rich. Soak the bread in enough milk to moisten it. Leave for a couple of hours, then squeeze the milk out. Put the bread into a food processor with the almonds and the garlic. With the motor running, add the oil gradually, followed by the water. Season with the sherry vinegar, salt and pepper. Stir, then taste to check whether you would like any more water or seasoning.